The generosity of millions of Norwegians means that Amnesty International is set to receive more than 165 million Norwegian krone (US $30 million) to help fund its work in strengthening human rights around the world. More than 100,000 volunteers with collection boxes knocked on the doors of two million homes for the Amnesty International Norway telethon fundraiser, while the Norwegian Broadcasting Corporation (NRK), the national broadcaster, dedicated eight-and-a-half hours of TV to the effort. 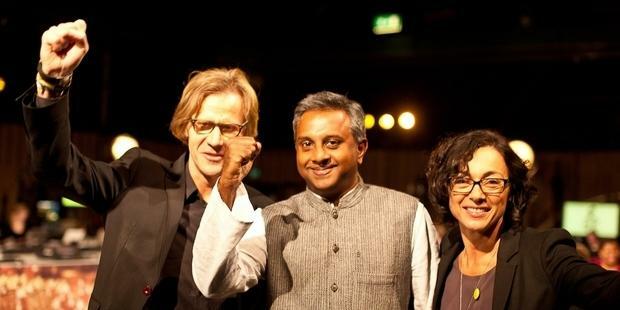 “This is a fantastic result,” said Salil Shetty, Amnesty International’s secretary general. “All of us at Amnesty International feel both proud and humbled by this wonderful generosity and support. “All this money has been raised in a fantastic atmosphere, with people being incredibly willing to give and talk about Amnesty International’s mission and efforts. It has been a wonderful recognition of the work we do. Donations to the telethon are set to continue until the final result is known around mid-December. It was the third time Amnesty International had been selected to be the recipient of the annual fundraiser, which was organised by NRK in cooperation with selected organizations and has been held annually in the country for 38 years. “This is among the most successful results of the telethon in its 38-year history,” added Salil. The NRK broadcast continuously from 3.45pm on Sunday 21 October until after midnight, with guests talking about how and where they worked with Amnesty International and discussing a variety of human rights issues and themes. An 80-hour radio show held over three days and concentrating on LGBTI (Lesbian, Gay, Bisexual, Transgender and Intersex) issues was also broadcast from a glass studio erected in the main square in Oslo to accompany the telethon. About 5,000 Norwegian companies financially supported the fundraiser, double last year’s number.